This is a simple pattern I found on a knitter’s blog (see below). 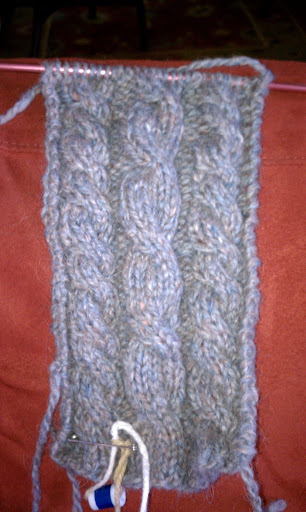 I am modifying the width to ensure I have enough yarn; going from 40 cast on stitches to 30. The purpose of this project is manifold. I am teaching myself continental style knitting, cabling without a needle and the end product will be donated to the school’s knitting art club annual outreach project. I am very pleased thus far. Once I block it the ends will shore up nicely. eta: http://theactorknits.blogspot.com/ Giving credit to the designer. I hope he does not mind the modifications, necessity being the mother of invention. Thanks for the credit, hope you enjoyed the pattern! I like it very much. I will post pics of my finished scarf here and on Ravelry. What I like about this pattern is that I am not tied to a written pattern. Now that I can cable without a needle and work flat on a circular, it is a one-needle project that is super portable. Most excellent!